There are said to be over 20,000 different named species of green algae. Algae occur in three different basic forms. These are categorised as planktonic, filamentous and macrophytic. These are single-celled microscopic plants that float freely in pond water. When planktonic algae are very abundant, they make the water turn green. This is known as an algal “bloom”. More infrequently, the colour of the water can be turned into other colours, eg yellow, brown or red. They include genera of cyanobacteria (the blue green algae, eg Gloeocapsa, Synechococcus, Microcytis) or one of several species of green algae genera (eg Euglena, Scenedesmus, Chlamydomonas). These algae form as thread-like structures that can be floating or attached to submerged items such as the pond walls or aquatic plants. The description “blanket weed (blanketweed)” is used to describe some of these filamentous algae. This third category of algae resembles true plants in that they appear to have stems and leaves. They are also attached to the bottom of the pond. The genus Chara is the typical macrophytic algal plant. It occurs in ponds with high levels of calcium carbonate or bicarbonate. Deposits of calcium on the surface of the plants make them feel coarse to the touch. This gives rise to the common name “stonewort”. The species of filamentous algae that perhaps causes the most concern in fresh water systems around the world is Cladophora glomerata. This is called blanketweed (blanket weed). However, there are over 150 different species of cladophora. Blanketweed (blanket weed) can grow at tremendous rates when the conditions in the pond are suitable. In very high light levels with high levels of nutrients, blanket weed can grow at over 2 metres per day. Other filamentous algae, also referred to as blanketweed or blanket weed, that cause problems in ponds are species of Spirogyra, Rhizoclonium and Enteromorpha. Worldwide, there are over 400 different species of the genus Spirogyra. Spirogyra tends to show in ponds as a tangled pond scum. It is also called “water silk”, “silk weed” and “mermaid tresses”. On sunny days, the mats of spirogyra filaments usually float on the surface of the water. They are kept afloat by tiny bubbles of oxygen arising from photosynthesis. These algal mats then sink when the sun goes down and the process reverses as photosynthesis is reduced. As a result, the strands of Spirogyra consume oxygen for cellular respiration. Carbon dioxide is then produced as a waste product. Where there are thick algal mats present, large fluctuations in the dissolved carbon dioxide and oxygen levels in the water can occur. This can lead to rapid changes in the pH of the water that in turn can cause stress and even death to other organisms, eg fish, living in the water. Enteromorpha intestinalis is another form of blanketweed that occurs in ponds. It is tubular in form and rarely grows longer than about 40cm. There are over 50 different species of the genus Enteromorpha. There are over 20 species of the filamentous genus Rhizoclonium. The presence of algae in ponds need not necessarily cause a problem. However, in many cases it does and the pondkeeper is advised to remove it. 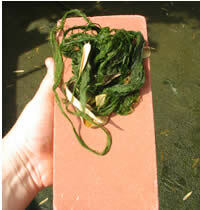 Planktonic algae can be controlled in garden ponds by installing an ultra violet filter. The UV light is very effective in agglomerating these single celled algae into clumps that then can be “caught” in the physical filter attached to the pond. However, UV filter lights have no effect on filamentous or macrophytic algae and other control methods have to be used. These methods include the use of chemicals and microbial products. Many pondkeepers prefer not to use chemical methods. Our Viresco™ microbial products will reduce and remove the nutrients, notably nitrate and phosphate, on which all algae feed. Planktonic, filamentous and macrophytic algae thus die of starvation!